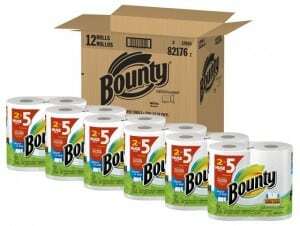 Bounty Paper Towel Deal: Stock Up Prices and FREE Shipping! I can't be the only one who gets super-excited about paper towel deals. They're just one of those things that I hate buying unless the price is right! Be sure to “clip” for the above coupon to save the most money in this deal! Final Price: $19.29 for 12 Huge Rolls! 12 Huge rolls is equal to THIRTY standard size rolls. Price per standard roll: just $0.64 EACH! That's a stock-up price! To make the deal that much better, your order will ship FREE!